Lake Bell is a master of voices, as seen in the stunningly good In A World, and shows off that talent here as Nancy the Brit when she’s really Lake the New Yorker. She’s an actress with a ton of talent, although up to now her role opportunities/choices have been poor to very poor. In A World and Million Dollar Arm changed things a bit, but unfortunately Man Up is a step back toward the crap she’s done all too often. It’s not the fact that this film is a romantic comedy that sinks it; you can still make rom/coms good, just look at What If and Sleeping With Other People. And it’s not the fact that it’s English; Simon Pegg style humor is hilarious. No, it’s a matter of good taste vs bad taste, good choices vs bad choices, and Man Up seems to turn down the wrong path at every single decisive fork. Nancy is a serial under-attempter, refusing to take chances when it comes to dating and, really, to life in general. But when the opportunity arises to be someone else for one night and perhaps really connect with a decent guy, she actually seizes it. Mistaken for Jessica, a woman on a blind date, Nancy goes out on the town with Jack, thinking “hey why not” and “what have I got to lose”. But keeping the secret from him that she’s not actually who he thinks she is may not be as easy as it seemed when they first sat down for a drink. And what’s more, OMG, she might actually fall for him and THEN what will she do?! Nancy is about to learn a very valuable lesson on honesty, one she’s almost guaranteed to ignore. OK, it’s as ridiculous as it sounds. What makes it a little bit better is that Simon Pegg is both British and funny, making such a forced story almost bearable, at least for a while. And the film is short, so no investment needed on your part. But other than one hilarious side character performance from Rory Kinnear as Sean the Obsessed Boy-Next-Door, that’s where the list of positives ends. The rest is a swamp of standard jokes, unoriginal sap, non-shocking shock factorials, and dull conversations that go on far longer than they’re worth. By the end, even Bell’s accent was starting to wear thin, and I began to hope for the finale, something that I could predict as easily as blinking. 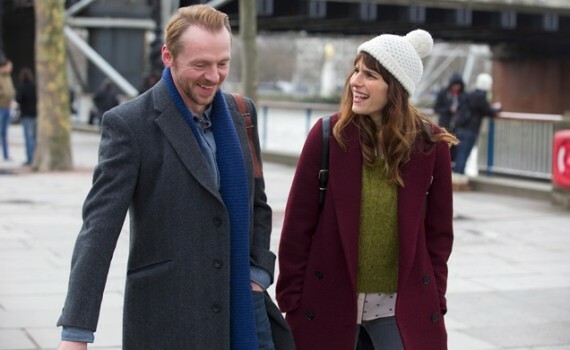 Man Up doesn’t redefine the genre; it panders to it and ends up sub par as a result.